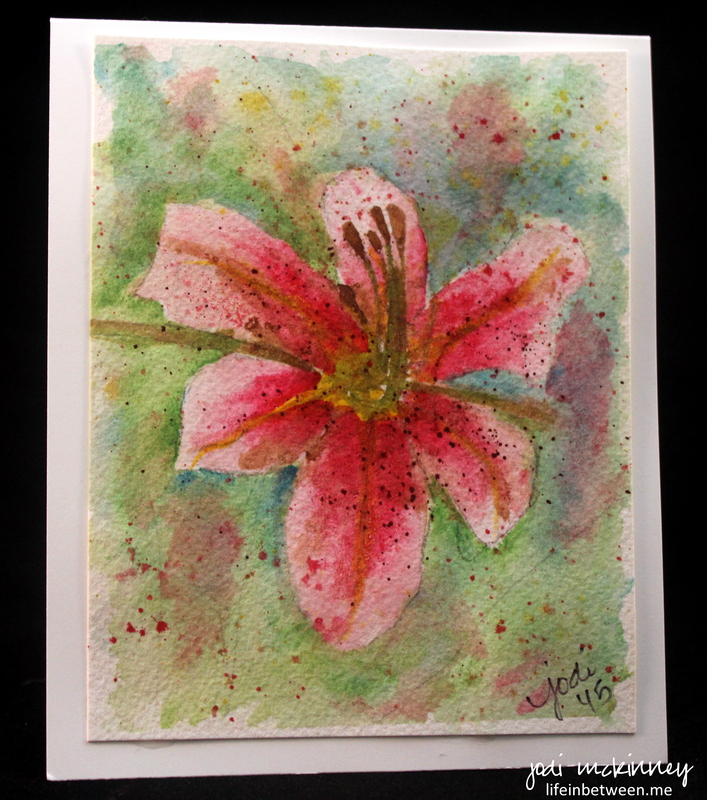 A sweet friend told me one of her favorite flowers is the Stargazer Lily and “challenged” me to paint one. 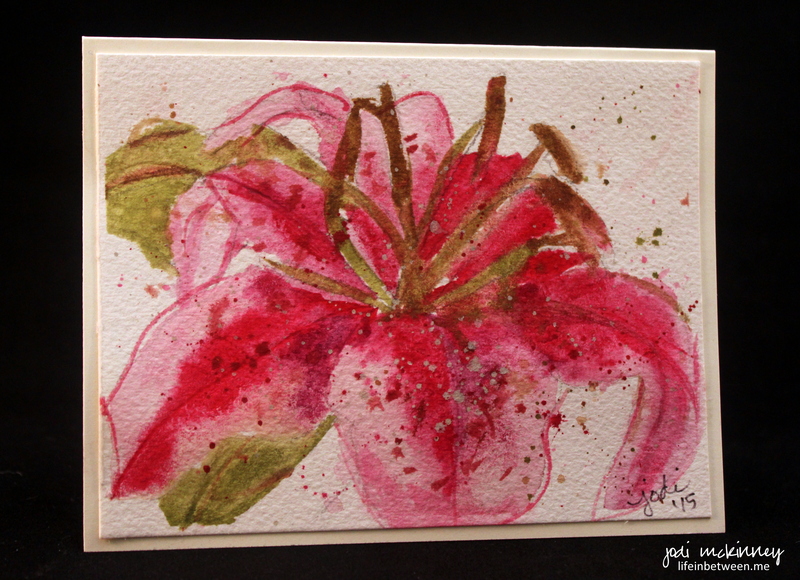 First thing I had to do was “google” what a Stargazer Lily is! Then I tried to paint one. I struggled with this flower, and ended up doing several versions thinking each time I would be happy with the result. But, alas, I am still not sure I am completely happy with any of these, and I’m not sure my friend will be either, but I decided to share them and see what you think. Do you have a favorite? Do you like any of them? After drawing and trying the first one (#3) with a background and then the second one (#4) in a little different style and without the background a couple of days ago, Sunday morning I drew this darn flower again and came up with my third rendition (#2). Still not happy, I decided to just slap some water and paint on the paper without drawing it first, and I created my fourth version (#1) in about 10 minutes, and I think it’s my favorite. But when showing my hubby and youngest son all four, they each chose a different one! LOL! I still don’t think I have even come close to capturing/mastering this beautiful flower, but here it is Tonya. If you like one of them, let me know, and it will be on it’s way. 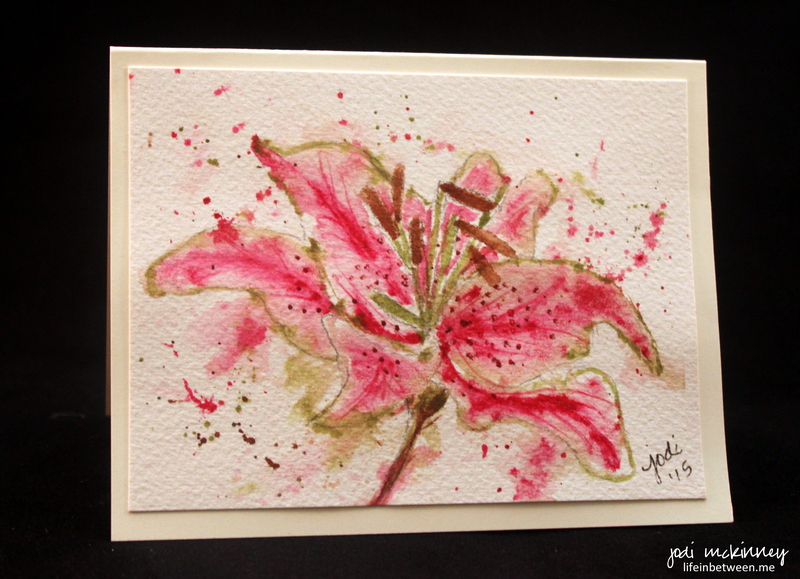 Any artists out there mastered the Stargazer Lily? 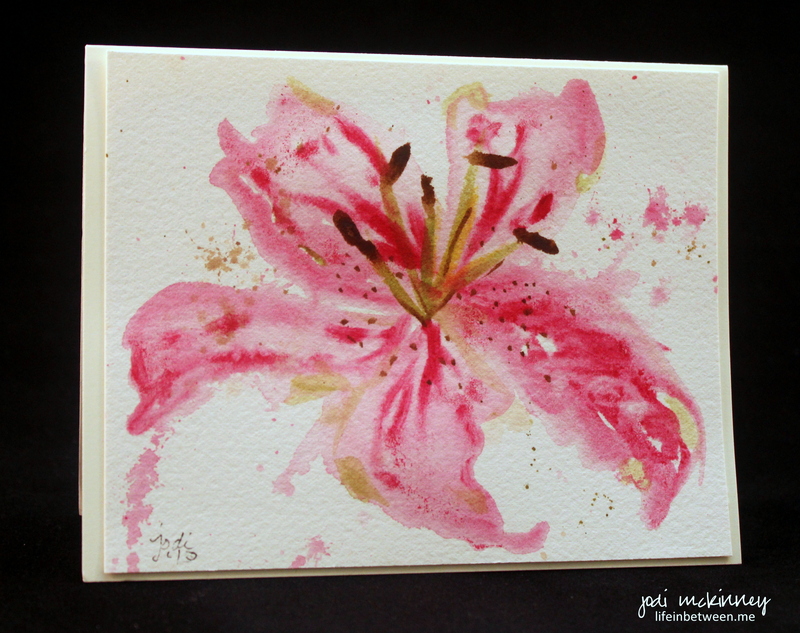 The challenge of this one for me was the lighter colored outer edges of the flower I think. I would love to hear any tips! 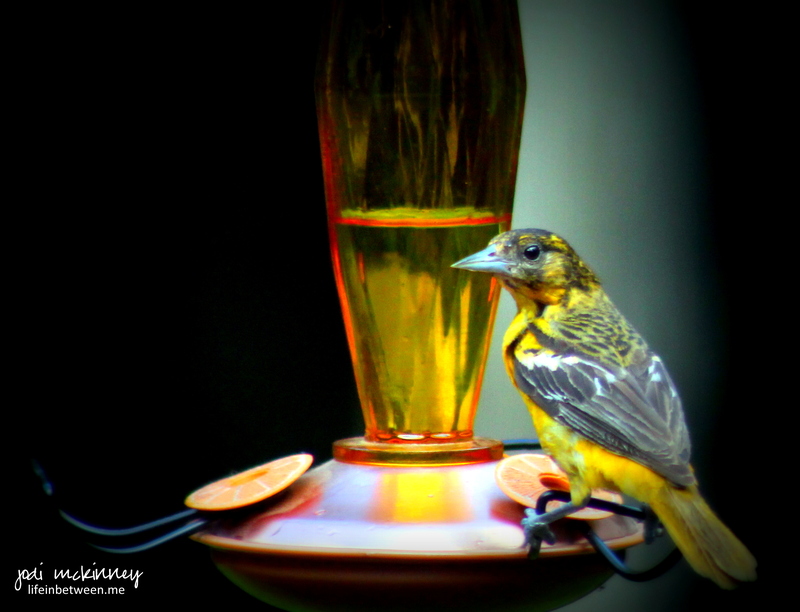 I was so excited to buy an Oriole feeder for the hubby for Father’s Day [ahem], so we he could watch the beautiful orange birds that we have occasionally seen in our backyard. That first day we hung it out, this beautiful young fledgling appeared. “Score!” I thought. And a Big Woohoo! But, alas, we poor hubby hasn’t seen another since. the hummingbirds are enjoying it! 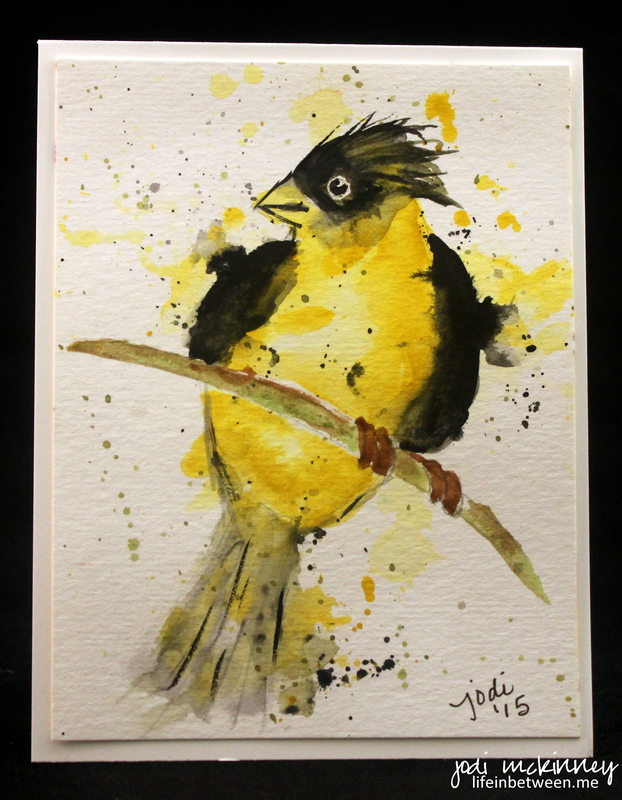 But mostly – it’s all for the birds! The goal is to post a photo of a subject that keeps you coming back? 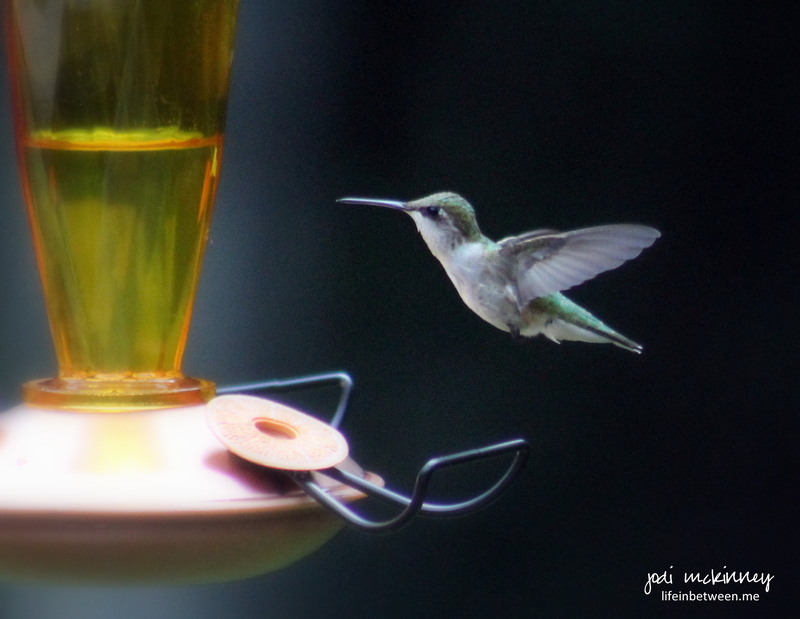 I have to admit… I’ve become a bit of a “backyard bird nerd.” So I thought an appropriate photo(s) to share would be one from our backyard menagerie. 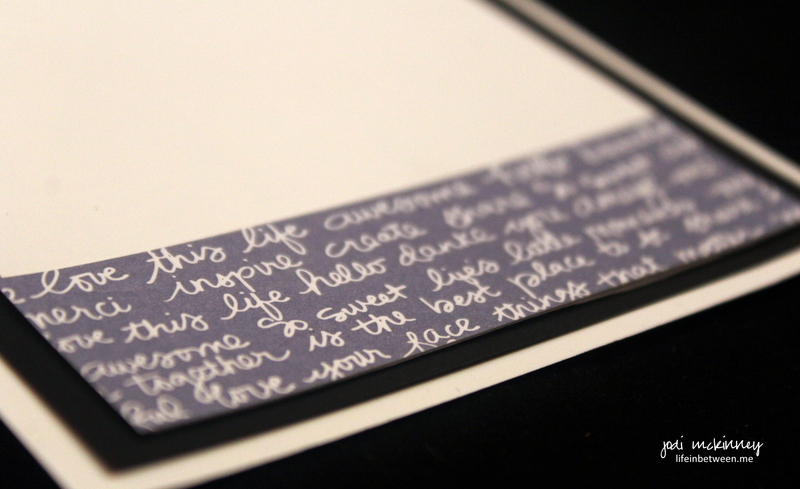 I have always loved mailing cards to family and friends. It is such a simple way to bring such great joy. Electronic communication is quicker and easier and more immediate (and I am all about that! ), but knowing that someone took the time to choose, or even better yet make a special card, hand write a note, address the envelope, adhere postage, and take to the mailbox or post office, is quite flattering – right? My BFF Jill makes the most amazing handmade cards, and I am always so thrilled when I find an envelope in the mail with her handwriting on the envelope. I hope people feel that way when they receive a card from me. I hope they feel the love. I hope they appreciate the time and effort. I hope it makes them feel special. 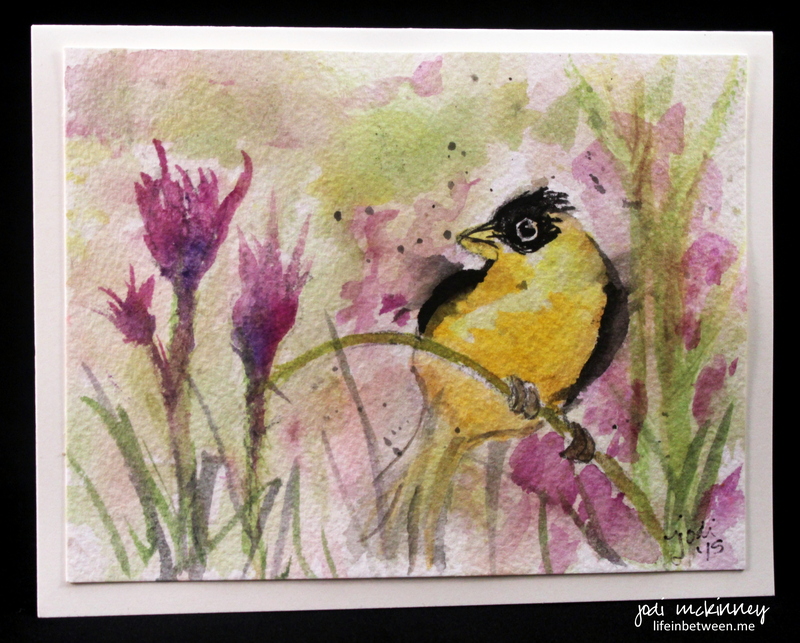 That is why it is such a thrill for me to be a Guest Designer for the Design Team at The Paper Players and make a card each week to inspire others to create and share this joy. This week’s challenge is a sketch challenge based on the photo above. We get to make whatever we want that closely resembles this sketch inspiration. I used this as an opportunity to create a “thank you” card. 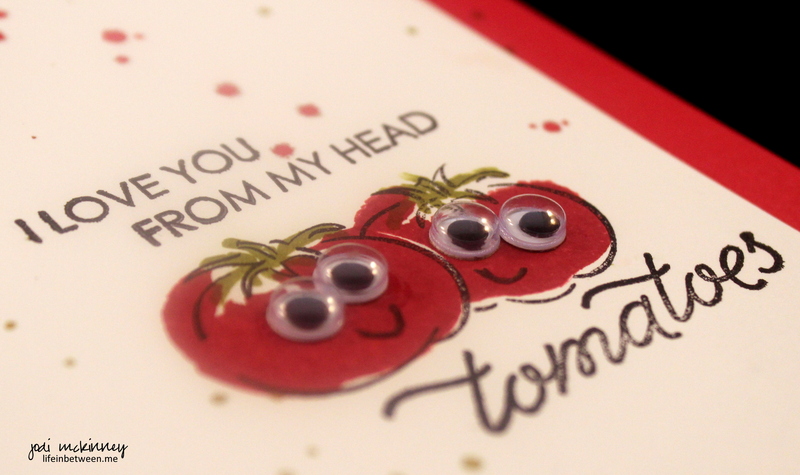 There are so many people I could send this card to…. The happiest people are those that see and appreciate these cherished moments. It is so good for the soul to take time to realize these sweet gestures, and even grander when you have the opportunity to reciprocate or give thanks and appreciate. 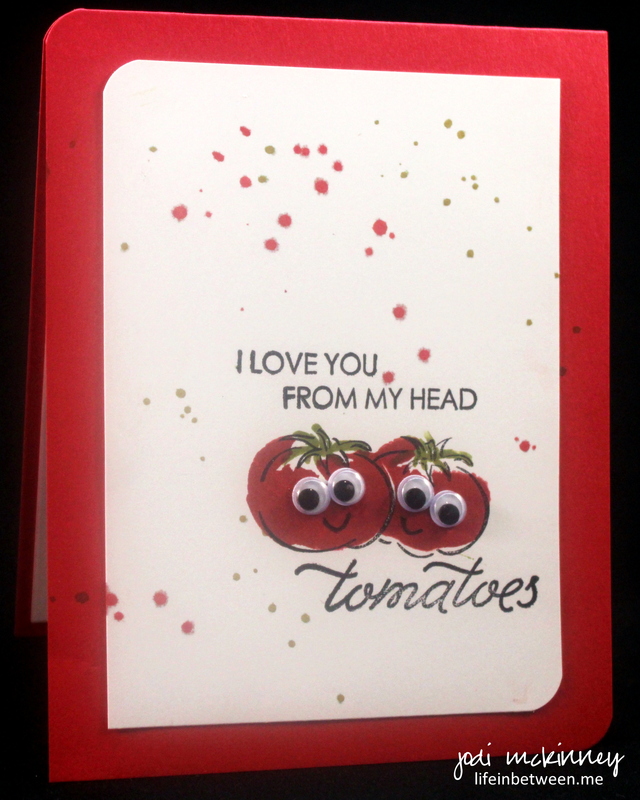 So I will look forward to sending this card to a special sweet someone who made my day. And I hope I’ve inspired you in a small way to show gratitude, appreciate kindness, and cherish the moments. He’s going to ask for a glass of milk. And then he’ll probably want a straw. As I was looking at these shots of my latest twist on chocolate chip cookies, I couldn’t help but be reminded of that fun children’s book. Especially after this stack – I kept thinking… more – More – MORE! 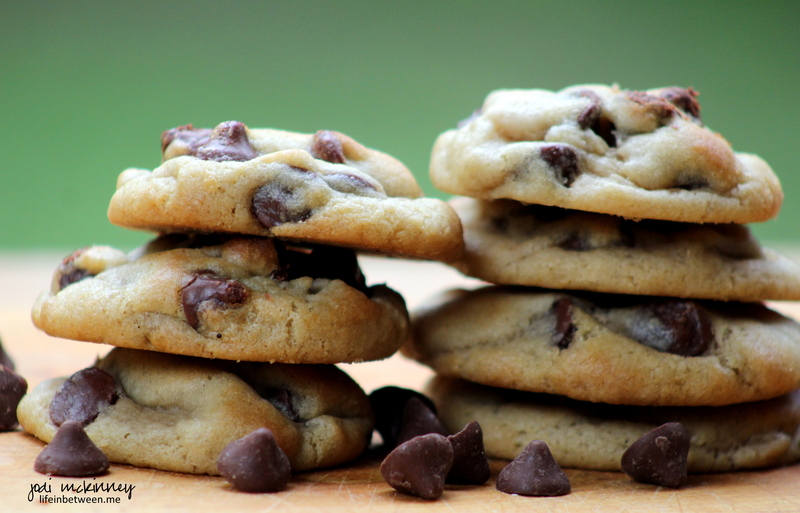 I bake chocolate chip cookies A LOT. I’m kinda known for it. Especially with our sons’ friends. And I love the joy it brings – the smiles they create – the happy tummies – the grateful hugs. This latest version was a BIG HIT! Instead of semi-sweet morsels, I used the new Nestle Toll House Delightfulls Caramel Filled Morsels. 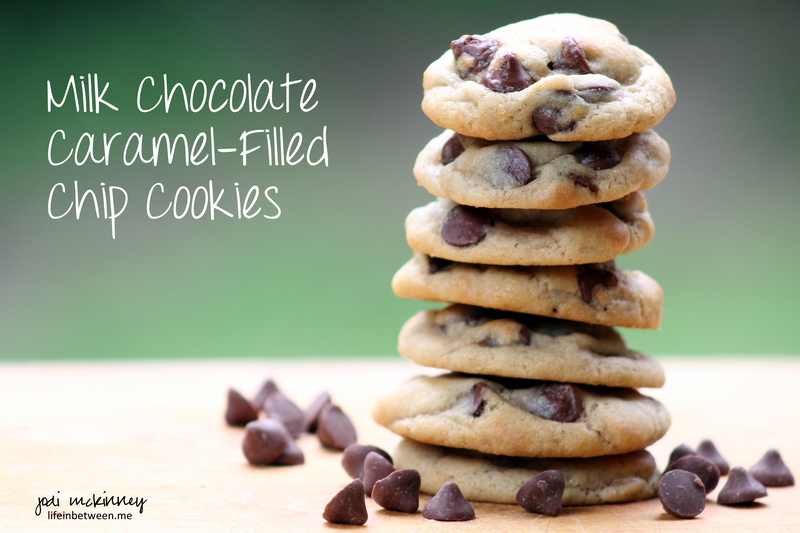 Milk Chocolate Caramel Filled Chips in a cookie!! 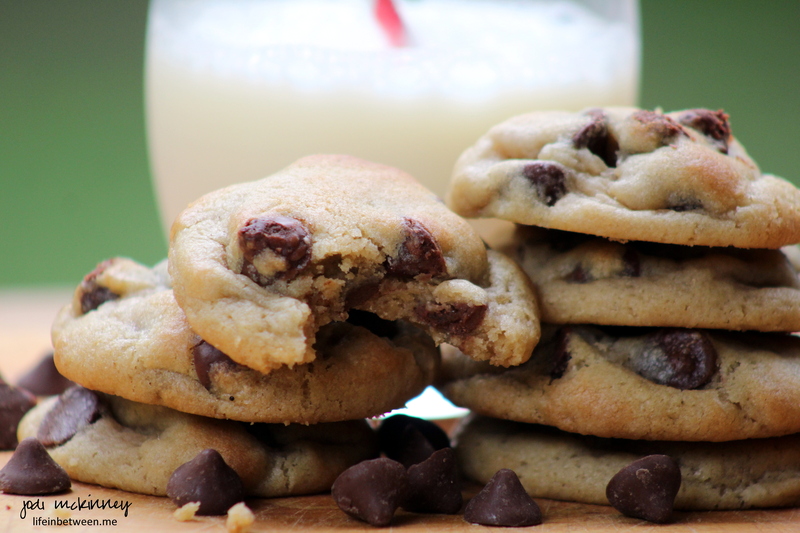 I used my tried and true chocolate chip cookie recipe – subbing these DELIGHTFULL morsels for the regular chocolate chips. 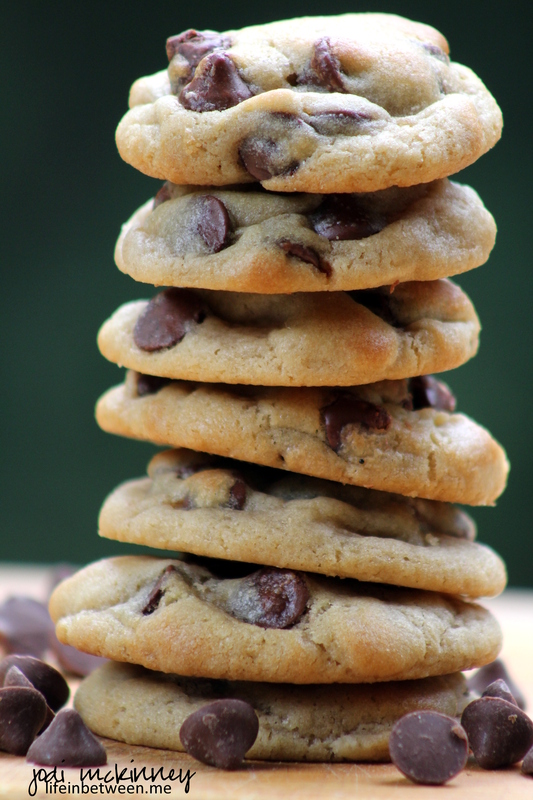 Easy Peasy – and guaranteed to be a Big Hit with whoever you decide to share these with! 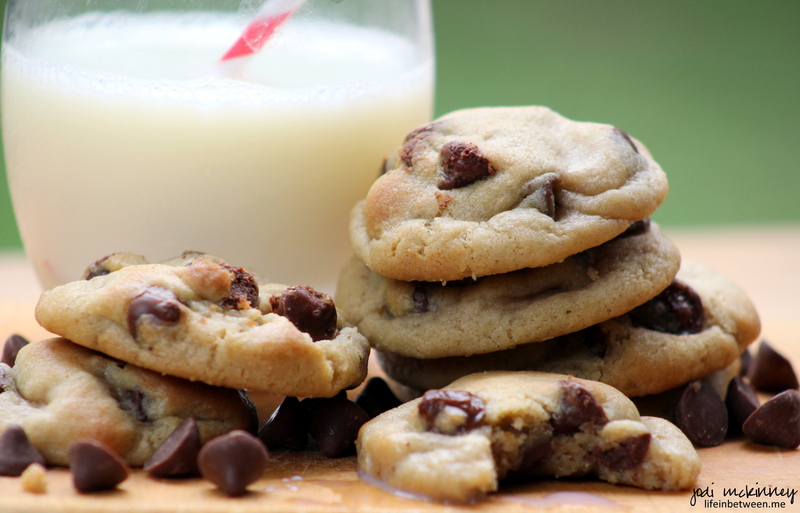 Grab a glass of cold milk – even if it is Skim – and DUNK! Fold in chocolate caramel morsels. Refrigerate dough for at least 2 hours or up to 2 days. 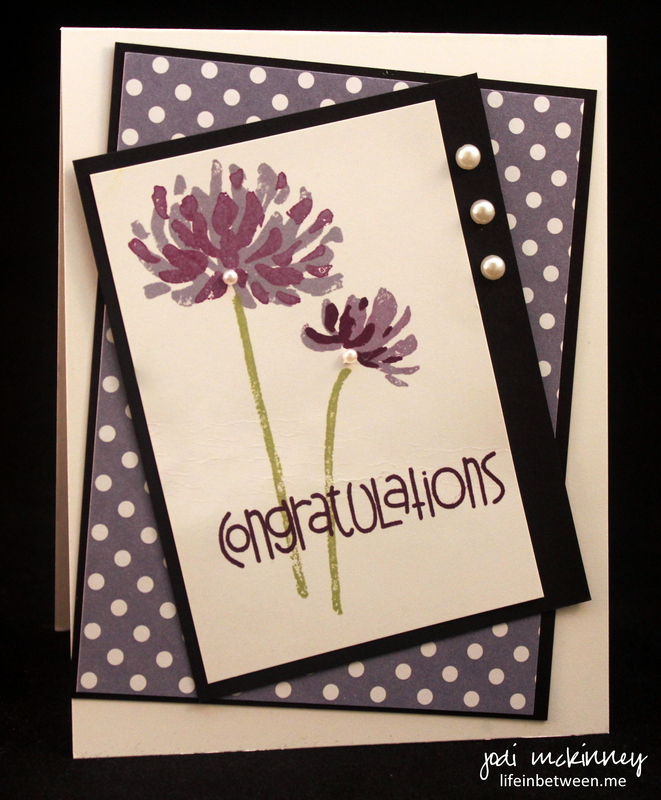 Today I will be celebrating the retirement of a sweet friend I work with, and I wanted to make her a special card. 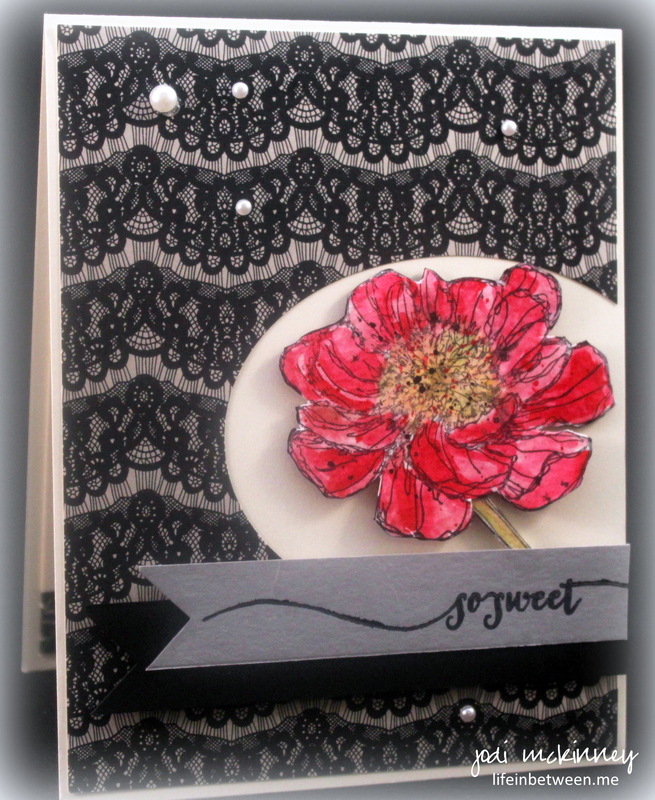 I used some new DSP (Designer Series Paper) from StampinUp (SU) that has fun polka dots on one side and sweet handwritten happy words on the other side. 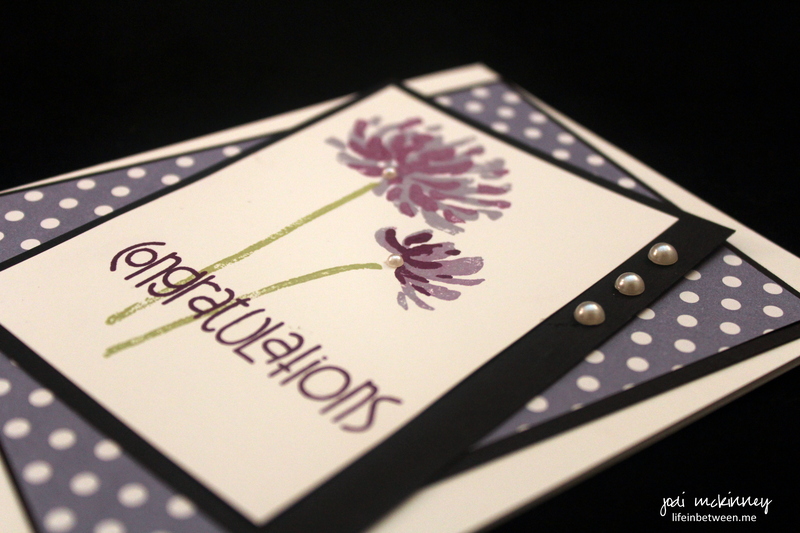 I was feeling purpley for my friend and used the SU “Too Kind” Stamp Set to stamp the flowers and my favorite “Sentiment Sampler” from Lil’ Inkers for the Congratulations sentiment. 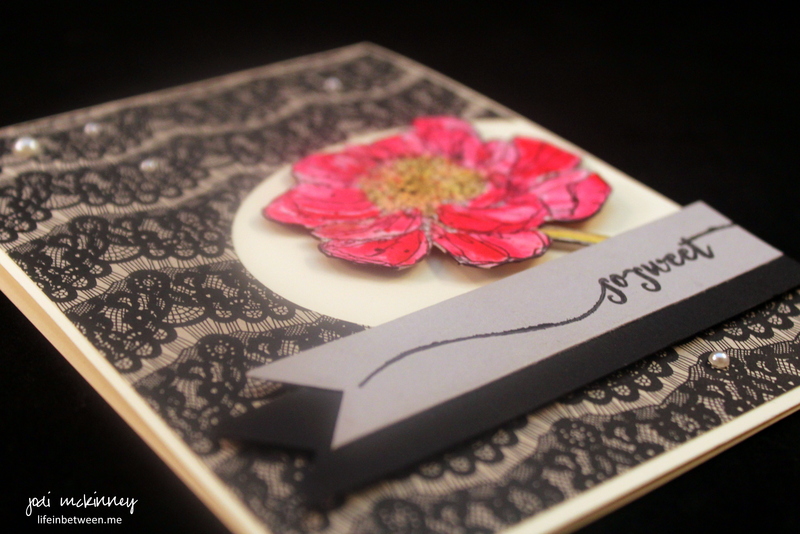 A couple pearls for embellishment and a few off-balance layers of framing in black finished up my card. I sure will miss this workplace “girlfriend” (as she is famous for calling everyone – expect for the men who she typically fondly referred to as “boyfriends”). After painting Spooky earlier this week, I still felt like doing more. I was on a watercolor roll. I saw a Youtube video by The Frugal Crafter. So I made the one above. which meant loosening it up and splattering a pinch. So I went at it again – on my own this time. I sure have mountains to climb! 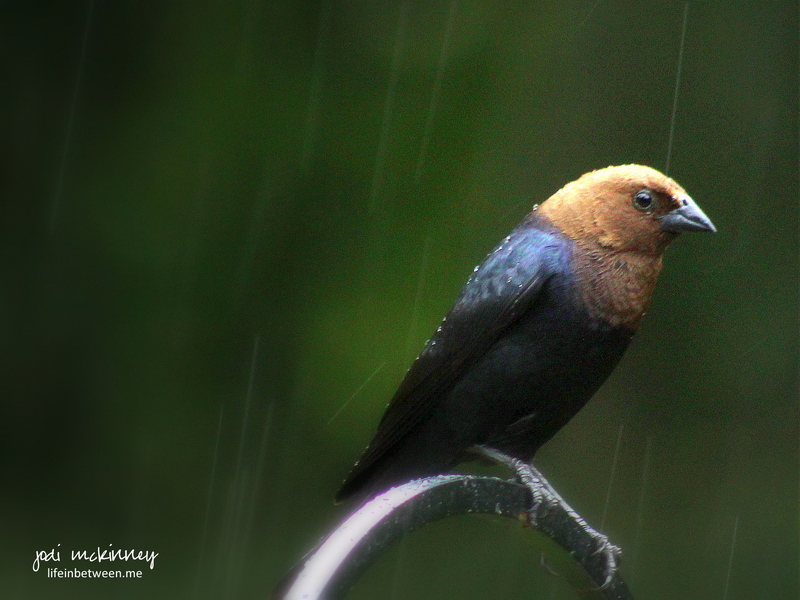 The brown-headed cowbird is another member of the menagerie that hangs out in our backyard. Our son Nick claims this is his favorite. The cool thing about this bird is the iridescent nature of its silky black body. Sometimes he looks blue or purple depending on the lighting or angle. Such a beauty he is – eh? The other day when it was pouring down rain, he was perched so regally above the feeder with the rain just rolling off his slick, drenched feathers. standing tall and proud no matter the circumstances…. Our dear daughter-in-law lost a special beloved furry buddy this weekend. My heart breaks for her as this is her first experience losing a pet. 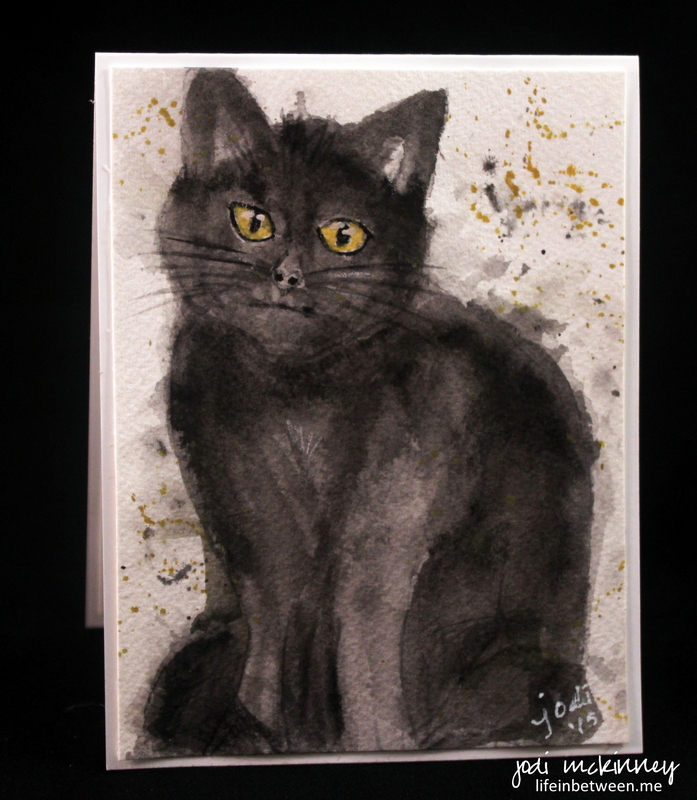 I thought of her all day yesterday and wanted to do something special, so I decided to try to draw and watercolor a photo she posted in memory of Spooky and make it into a card last night. This is my first try at doing a cat, and he sure doesn’t look exactly like sweet Spooky. But hopefully it is close enough to give Colleen a little remembrance and show her how much I love her and ache for her loss. What is better than a warm apple dumpling with a scoop of vanilla ice cream? 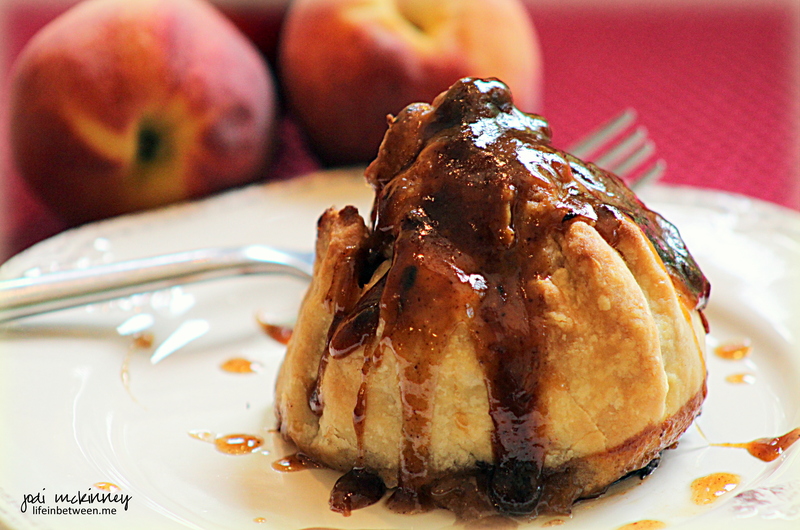 How about an old-fashioned peach dumpling with ice cream and peach brandy in the caramel sauce?!?! O M G are these amazing! Hubby loves peach pie, and I had some peaches getting very ripe on the kitchen counter Father’s Day morning. 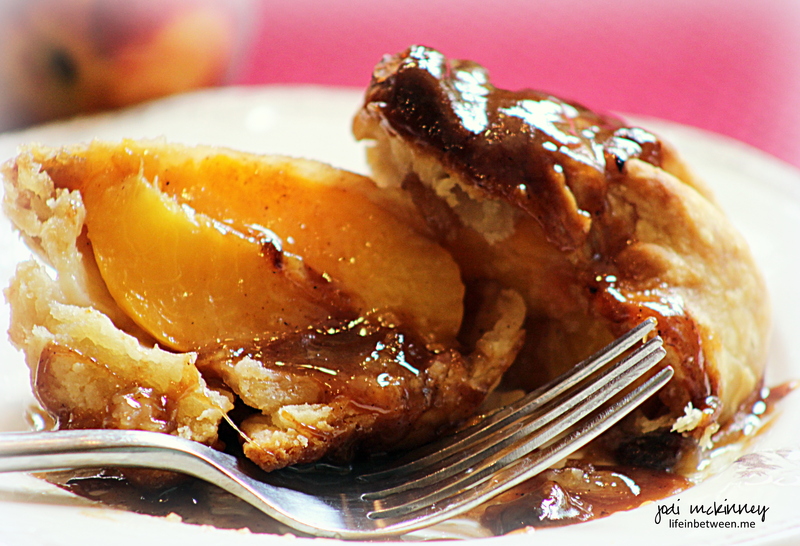 So I decided to make him this special treat of flaky pie crust wrapped around sweet juicy fresh peaches stuffed with brown sugar, cinnamon, butter and vanilla and drizzled with a creamy, caramely, brandy infused sauce. Is that Merv a lucky guy or what??!! It was a great weekend, beginning with my boss winning Entrepreneur of the Year Friday evening at a gala I was so fortunate to attend with him and some of our colleagues and friends, and ending with having the kids over for Father’s Day. Our oldest son, Jake, grilled an amazing pork tenderloin he marinated in fresh herbs and lemon, and he also brought over his homemade macaroni salad (one of hubby’s faves). Our daughter-in-law, Colleen, brought hubby more goodies – homemade apricot turnovers and homemade cinnamon swirl bread. He’ll be set for a while! And this is all after being treated out to breakfast at one of his favorite spots with our youngest son, Nick. Unfortunately, I ended up getting some kind of nasty “crud.” It started Friday evening at the gala when my voice started going and my throat got scratchy and sore. I woke up Saturday morning with my right eye sealed shut, coughing up a storm, and absolutely no voice. I tried to take it easy, and we had to cancel Saturday evening dinner plans with friends. I’m still feeling pretty punk, but oh well – still bucked up and prepared this yummy treat and enjoyed visiting with the family and playing Cranium and laughing way too much! Did you ever try to do a humdinger challenge with no voice?! Thank goodness whistling worked! I am the queen of improvising in recipes and had not had a chance to go to the grocery store this weekend feeling like I did, so when the recipe I found (at A Flock in the City) called for heavy cream in the sauce and I had none in the refrigerator, I decided to try substituting vanilla ice cream. Where there is a will there is a way! And I’m not sure I’d do it any other way after this!! I made a few other tweaks – using my own standby pie crust recipe, blanching and peeling the skin from the peaches, leaving out the nutmeg, and adjusting a few quantities of sugar and butter, but I really liked this recipe I found. Hubby loved them, so I’m glad I made this treat for him. I also got him a new bird feeder – a Squirrel Buster (thanks for the recommendation Jo) and an Oriole feeder, so the birds are sure having a good time. Bring a large pot of water to a boil, and blanch peaches for 2 minutes. Immediately remove to ice water. 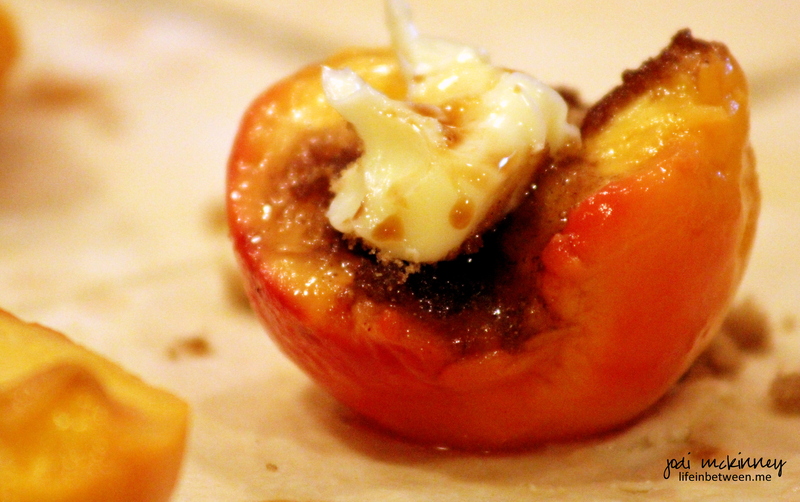 The skin will slip right off to peel the peaches. Place one peach half in center of each square, and fill with brown sugar and cinnamon, a dollop of butter, and a drizzle of vanilla. 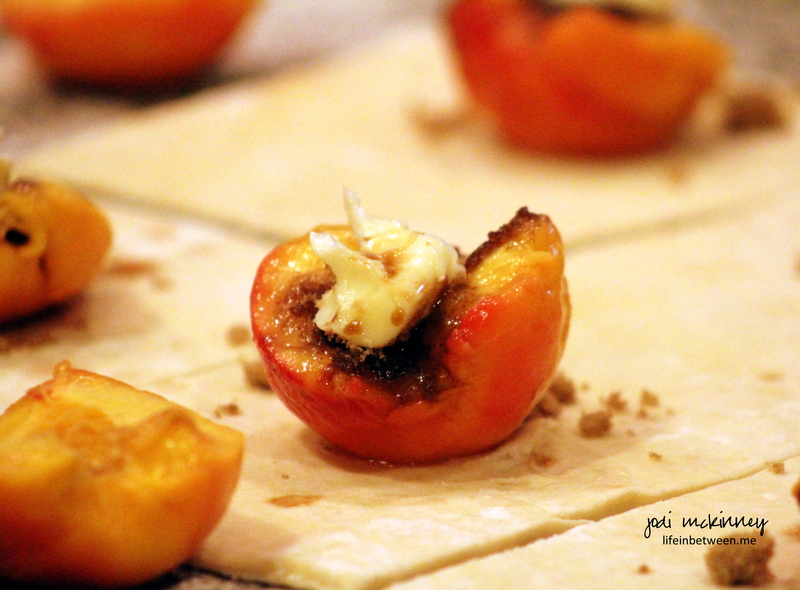 Place second half of peach on top, and wrap entire stuffed peach with dough – sealing to keep juices in. Place in 9 x 13 rectangular baking stone or dish. Prepare sauce by melting brown sugar and butter. Bring to a boil. Add vanilla ice cream and stir until melted and boiling again. 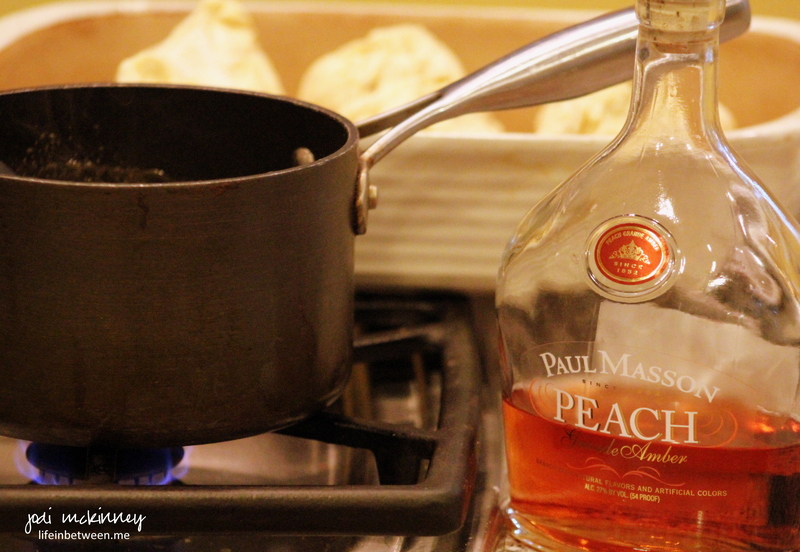 Add peach brandy, and continue boiling for 2-3 minutes. Pour sauce into bottom of baking dish around dumplings. Bake at 450 degrees F for 35-40 minutes. Serve warm with a dollop of ice cream or whipped cream. Hope you all had a nice weekend celebrating Fathers and families. My Father’s Day card for hubby was inspired by The Paper Players Clean & Simple (CAS) Summer Treats Theme (PP250). 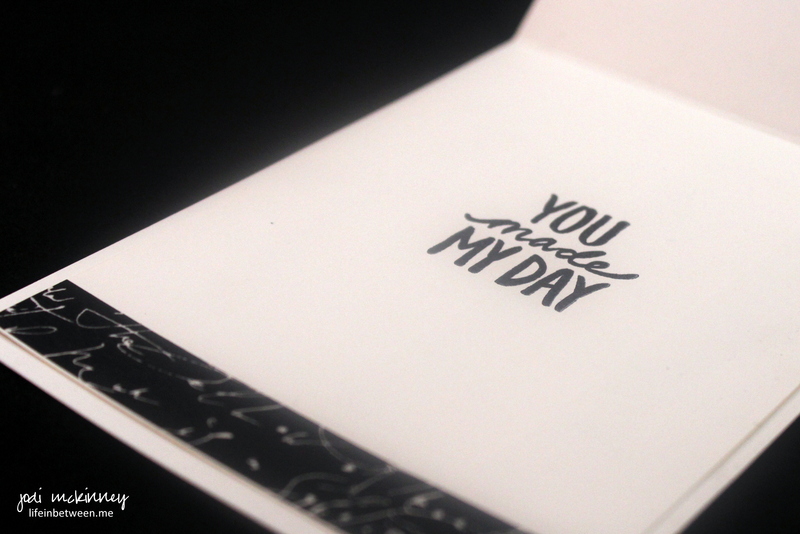 I love this punny stamp set from WPlus9 , and I have featured it a couple of times in the past here and here. What better summer treat is there than fresh ripe juicy tomatoes, and what better summer celebration than to honor our Dads for Father’s Day. I’m looking forward to sharing the day with the family. Wishing you a day spent with those YOU love from YOUR head to YOUR toes!